When it comes to your Employee Referral Program (ERP), it’s one thing to have a functional program in place, but quite another to have a program that actually yields a high percentage of successful hires. One of the ways to improve hiring outcomes is to ensure that the quality of referrals — the candidates who are being put forth and vetted — is high, explains Jeanette Ercila, who oversees the ERP for LinkedIn. In order to better educate employees, the talent acquisition team created very specific “referral profiles.” These profiles inform employees about specific skill sets LinkedIn is looking for in Engineering, Product, Campus and Sales roles. It’s a simple SlideShare deck, designed to make the process easy and clear for employees. If you want your ERP to capture the attention of your employees, so that it’s not just corporate background noise, try branding it. 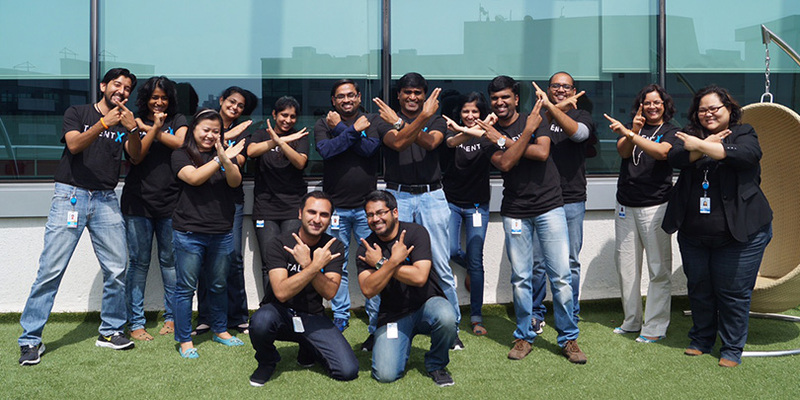 LinkedIn’s talent acquisition team worked closely with the company’s brand and marketing departments to come up with the name for the ERP program. They settled on Talent X. When LinkedIn launched Talent X last year, they did so with a campaign that included ads, swag, and posters, all featuring employees who had successfully referred three or more hires into LinkedIn. The goal of the campaign was to drive employees to the internal ERP site where they could learn about program policies, global openings and read frequently asked questions. One very successful way to draw attention to the new LinkedIn ERP program was running internal-only ads, targeting LinkedIn employees. 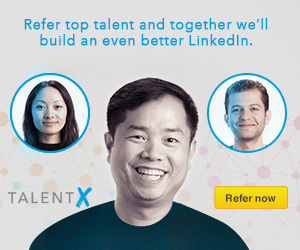 These ads showed up on the intranet and also on LinkedIn.com as “Work with Us” ads, visible only to people who work at the company (any business can do the same for their employees, using LinkedIn.com). 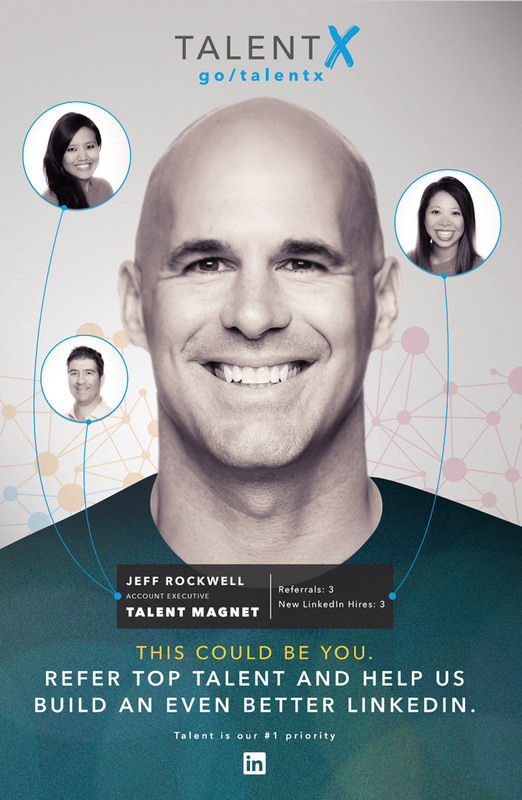 The ad banners featured LinkedIn “talent magnets” – employees who have made multiple successful referrals. The employee photo ads are outperforming other ERP ads and are driving strong traffic to the internal site. In order to offer a white-glove service and provide high satisfaction with the program, LinkedIn now has a team of recruiters who are solely dedicated to reviewing employee referrals. “We have a service level agreement committing to employees that we will review their referral and update them with a status within two business days,” explains Ercila. In order to increase transparency and accountability, the team also implemented a dashboard that measures how quickly individual ERP recruiters respond to requests and stick within the service level agreement. The final successful piece of the ERP is a recognition program called the Talent Magnet Award, where the CEO hands out an award to employees who have achieved strong results with their referrals. Moving forward in 2015, LinkedIn’s ERP team has plans to implement a second round of innovative initiatives under the leadership of Leigh Miller, who is now in the role of ERP program manager. Miller is excited to add to the exceptional groundwork that’s already been laid in ERP, and hopes to find ways to bring the successful program to even greater heights.